For most of human history, we effortlessly consumed (nose-to-tail) the things we needed for strength, health and happiness. Like the fertile ground that we once walked upon, we were a natural extension of this earth. In the modern world, we unknowingly struggle to fulfill our nutritional needs in order to support and sustain a vibrant, disease-free life. We are now part of a world where our health is not wholly ours... many leading experts believe that pervasive gut issues (dysbiosis, sibo, leaky gut) have a lot to do with the problem. The solution is to restore and rebuild our gut health with proven anthropological ways that are backed by modern science... this includes the use of intestine and tripe. Traditional peoples, Native Americans and early ancestral healers believed that eating the organs from a healthy animal would strengthen and support the health of the corresponding organ of the individual. For instance, the traditional way of treating a person with a weak heart was to feed the person the heart of a healthy animal. Similarly, eating the kidneys of a healthy animal was believed to nourish urinary ailments, boost vitality and support overall kidney health... Pancreas was fed to people with digestive and endocrine problems... spleen was fed to people with immune and blood deficiencies...1 intestines, stomach (tripe) and other gelatinous parts provided concentrated amounts of connective tissue, gelatin / collagen, probiotics and other gut-specific proteins that are now absent from the modern diet. Organs and glandulars were a staple of our early ancestors' diets as the ultimate superfood, for good reason. It turns out, this nourishing tradition is backed by science... "Radioisotope labeling studies in animals have shown conclusively that, when eaten, organs and glands selectively travel to the corresponding organs and glands in high concentrations. This research, done at the University of Scotland in Edinburgh, lends credence to the ancient practice of eating animal organs to help ensure health in one’s corresponding organs..." - Dr. Ron Schmid, ND. *11 Our early ancestors knew this, which is why their traditional diets included the frequent and nourishing consumption of nose-to-tail nutrients. 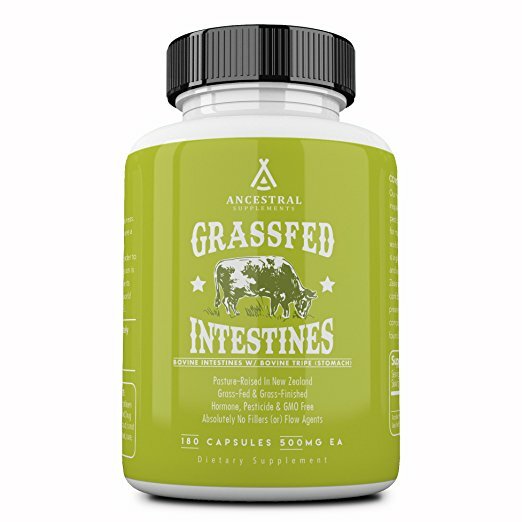 Our Grass Fed Intestines (w/ Tripe) is a whole food dietary supplement that provides 100% pure bovine intestines with 100% pure bovine tripe. This supplement can be taken with (or) without food (even though it technically is food). The suggested use is 6 capsules a day or as directed by a healthcare professional — for added support, the dose can be doubled. If consuming more than six capsules at once, the doses should be separated by at least three hours to improve tolerability. Many gut and digestive issues have a deficiency characteristic such as low stomach acid (80% of Americans), low pancreatic enzymes, low bile and/or low liver function. I'm not saying that all do, just a lot! Low Acid — Restrict liquids with meals... most Americans actually have LOW stomach acid so stop diluting it with water during dinner... if that's you, also consider adding Betaine HCL and/or Apple Cider Vinegar to produce adequate stomach acid to get the job done right (go here to learn more). A ketogenic / paleo / primal diet can help address the root cause. Low Enzymes — Consider eating pancreas or supplementing with pancreatic enzymes to help... a struggling thyroid, heavy metal exposure and pancreatic insufficiency can all suppress enzymes. A ketogenic / paleo / primal diet can help address the root cause. Low Bile — Our early ancestors used bile from the gallbladder... it was sprinkled on the meat and used as a condiment as we might use mustard today. Word has it that bile did a lot for the taste of liver. If you can't do this, consider supplementing with ox bile. A ketogenic / paleo / primal diet can help address the root cause. Low Liver — Most Americans have non-alcoholic fatty liver that causes a sluggish liver and sluggish bile... supporting your own liver health with lots of choline from egg yolks and eating grass fed liver will do wonders. A ketogenic / paleo / primal diet can help address the root cause. By now you know the theme... a standard, low-ish carb ketogenic / paleo / primal diet can fix most of these issues over time. For serious gut and digestive issues, a high fat, moderate protein, lowish-carb ketogenic / paleo / primal diet can be remarkably therapeutic (see below). Ketosis is a high fat, moderate protein, low carbohydrate way of eating. Have a look at what I eat but be careful with too much protein as this can kick you out of ketosis. TYPICAL KETO — 75% healthy fats, 20% protein and 5% carbohydrates. Honorable Mentions For Targeted Support - may use Thymus or Spleen for allergies or to boost immune system... Kidney for kidney and urinary support... Brain if the brain need a boost... Bovine Tracheal Cartilage to recover an injury or for intensive gut support... Thyroid in the winter when little to no carbs are available... Adrenal if adrenal support is required... you get the picture. Not all organs and glands are the same. Look for the highest quality bovine intestines and tripe... It should come from pasture-raised, grass-fed and grass-finished animals that are hormone, pesticide and GMO free. If considering a supplement, look for one that is ultra pure (without binders, fillers (or) flow agents) and look for the freeze dried variety as these have been shown to optimally preserve nutritional factors, growth factors and co-factors. Certainly, not all organisms survive after being harvested, ground and freeze-dried... but some do! And yes, the longer the tripe is frozen, the more of them die off. And since many of these organisms are actually dependent on each other for survival by utilizing each other’s byproducts, the deaths cause a chain reaction and results in the death of more and more organisms. The take home message here is that our DNA evolved with this stuff... our early ancestors consumed intestines and stomach straight out of the carcass and we got our fair share of microbes from using these as cooking vessels too — some do survive! There are all sorts of different types of microbes in the rumen, such as fungi, bacteria and single-celled eukaryotic organisms called protozoans. There are also some archaea, which are ancient microorganisms that live and survive in extreme cold and extreme heat environments. If you need a good probiotic, you'd be better off doing what our tribe does... eat your fermented veggies like kimchi, sauerkraut or try some natto. 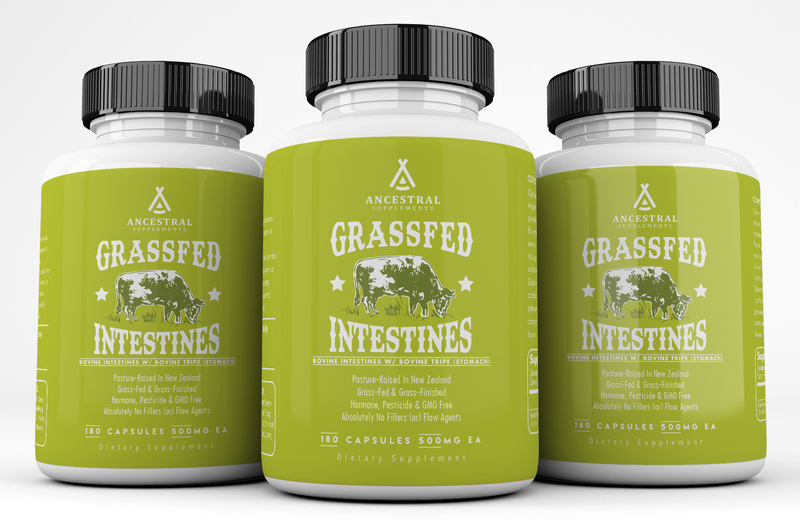 If you need targeted support for gut health that's rich in gut-specific building blocks, collagen / gelatin, glutamine with some organ-derived probiotics, then our Grass Fed Intestines (w/ Tripe) sounds like the perfect match!